This page explains how to create a .reg file. The idea is that you can double-click a .reg file and thus merge its values with those in your Vista registry. One advantage of a .reg file is that it is easy to apply; you don’t need to drill down through endless keys, as you would with regedit. Another advantage is because it’s a text file you can open with Notepad and then edit the values easily. An additional benefit is that .reg files provide their own built-in documentation for changes that you make to the registry. The main purpose of .Reg files is to modify the operating system’s behaviour by changing values in your registry. Perhaps you have seen such .reg files as part of a program’s installation package? It is deceptively easy to merge a .reg file with your registry, you simply double-click a text file with .reg extension. An alternative method is to introduce the values held in the .reg file by using regedit’s import facility. Where you need to automate a registry change, you could script the command: regedit /s path to .reg file. Whilst it is easy to import the contents of a .reg file into the registry, do make sure you know what you are doing. Remember that unlike clicking in a GUI, there are no internal checks on the consequences of changing the registry values. I leave creating and testing the content of the .reg files to other dedicated pages, on this page I want to concentrate on the general techniques for creating a .reg file. The easiest way to begin is by launching regedit, then select the value you are investigating and exporting that branch of the registry. Naturally, allow regedit to save the file with a .reg extension. Once you have created the experimental file, examine it in Notepad. Right-click the file and then select: ‘Open with’. If necessary make changes to the values and then import the .reg file into the registry. When you have perfected the .reg, you can import its settings to different machines. Launch Regedit. Click on the Vista Start Button, type ‘Regedit’ in the ‘Start Search’ dialog box. File Menu – Export. 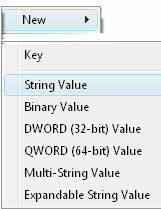 From inside Regedit, click on the File menu, select Export and choose ‘Selected Branch’. Note the .reg file extension. Remember the path. The default path will be ‘Documents’, however you may wish to save the .reg files into a dedicated folder, for example c:\ reg. Beware, if you double click a .reg file the default behaviour is for Vista to try and add the contents to your registry. The best procedure for reading the .reg file is to right-click and then select ‘Edit’, or ‘Open with’, from the shortcut menu; what that does is open the xyz.reg file in notepad. Example .reg file from the Winlogon registry folder. Quite reasonably, the, very first line of your .reg file contains the name of the Registry editor. For Vista, XP and Windows Server 2003, the correct name is: ‘Windows Registry Editor Version 5.00’. Older registries such as Windows 95 and NT 4.0 use ‘REGEDIT4’. Later registries are backwardly compatible, thus Vista understands ‘REGEDIT4’. Incidentally, even though Vista’s regedit reports to be version 6.0 in its Help / ‘About’ menu, the .reg files that it creates report to be from Version 5.00, strange but true. If you create your own .reg file, then it is possible to place judicious comments by preceding that line with a semi-colon. ; Created by Guy Thomas. Purpose to display the Build Number on the desktop. A plain entry in the .reg file means a REG_SZ type of value, for example: "Shell"="explorer.exe". With hexadecimal entries, note the word dword to the right of the equals sign, for example: "passwordexpirywarning"=dword:0000000e. Incidentally, 0000000e in hex is 14 in decimal. REG_DWORDS take only hexadecimal numbers, whereas REG_SZ are more flexible and take text or decimal numbers. See more examples from Windows 7 .reg files. The secret of deleting registry entries is to master the minus [-] sign. Earlier, I mentioned the phrase, ‘add keys and values’, strictly speaking, I should have used the word merge instead of add. The default behaviour is to keep all existing registry entries, and append the values in the .reg file. However, if the new value creates a conflict, the .reg setting wins. Note if you erroneously enclosed the minus sign in speech marks ("-"), then you would be setting the default password as equal to minus – probably not what you intended. By far the most common registry types are REG_SZ (String Value) and REG_DWORD (dword). However, to see the full list, call for regedit and right-click in the right pane, select New, and now you should see a list of all the possible registry types, see the screen shot to the right. Key – Means, give me a new folder, or a new container object. String Value – Text or numbers. Binary Value (REG_RESOURCE_LIST) – Machine readable 1 and 0 used by drivers. DWORD (32-bit) Value – Hexadecimal value (not decimals). QWORD (64-bit) Value – Hexadecimal, capable of even bigger numbers. Multi-String (REG_EXPAND_SZ). String values separated by commas or spaces. Expandable String Value – Expandable in the sense that they can contain variables which are resolved when a program calls for this data. When you need to create your own .reg file, it is probably easiest to start with an existing file and modify its settings. One way to obtain such a file would be to export a branch of the registry using regedit. While it is easy to build your own .reg file, here is a reminder of a few simple syntax rules. Here is the completed .reg file as seen in notepad. As you save, remember the .reg file extension, for example Auto.reg. The .reg file uses: @="xmlfile"
What I recommend is that you start learning the syntax and structure from an existing .reg file. You can obtain this special file by exporting a branch of the registry with regedit. Once you have an example .reg file, then pay close attention to the layout, start with the name of the Registry Editor Version, then a blank line, finally, the actual settings that you wish to merge with the registry. Here are specific .reg examples.